It may have been a chilly January, the snow had been threatening to overwhelm us and the northerly winds were whistling through the trees, but it turned out to be a beautifully sunny day – be prepared for the worst and enjoy the best! 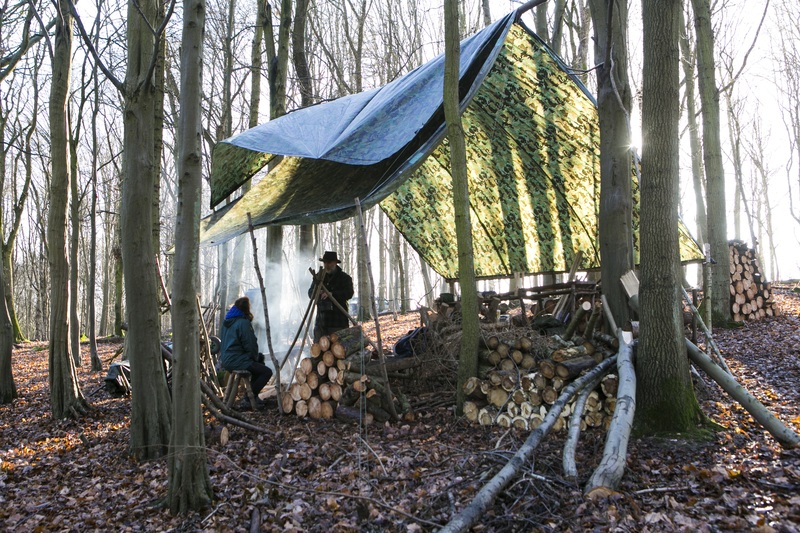 There is something quite special about setting up a camp in the woods, finding that place which just feels right. 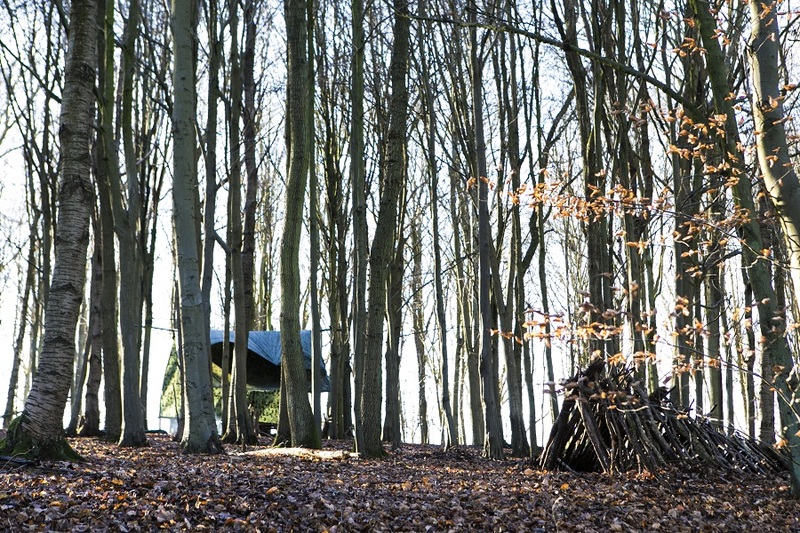 Our location provides views across the woodlands below, with beams of sunshine on a sunny day and an abundant supply of timber for our campfire. Hidden away by a holly bush is our composting loo, a room with a view, and closer to hand are tables and benches to sit upon, oh and fresh water on tap. With the kettle simmering, there is always time for a brew – tea or coffee? 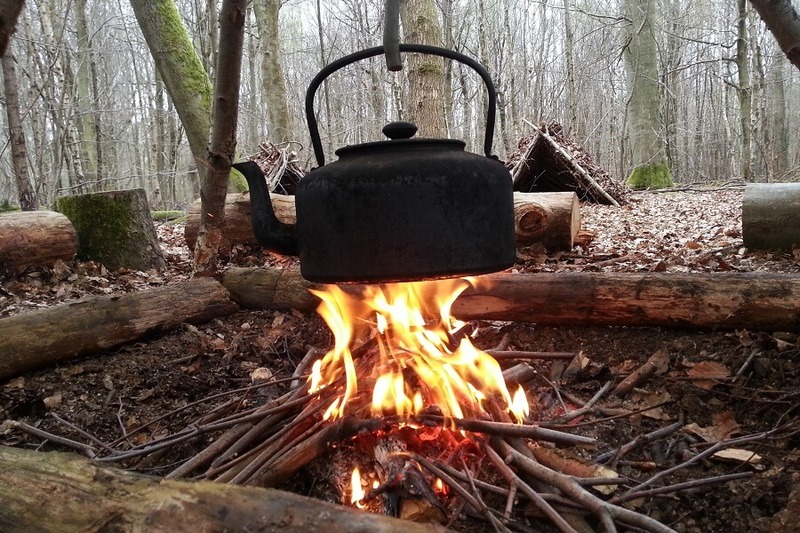 The kettle is always simmering, it’s the first job of the day to light the campfire and the last, to extinguish it at the end of our time in the woods. It’s a favourite time for me to get to know my visitors and enjoy a conversation with a mug of coffee, tea or perhaps a hot chocolate. 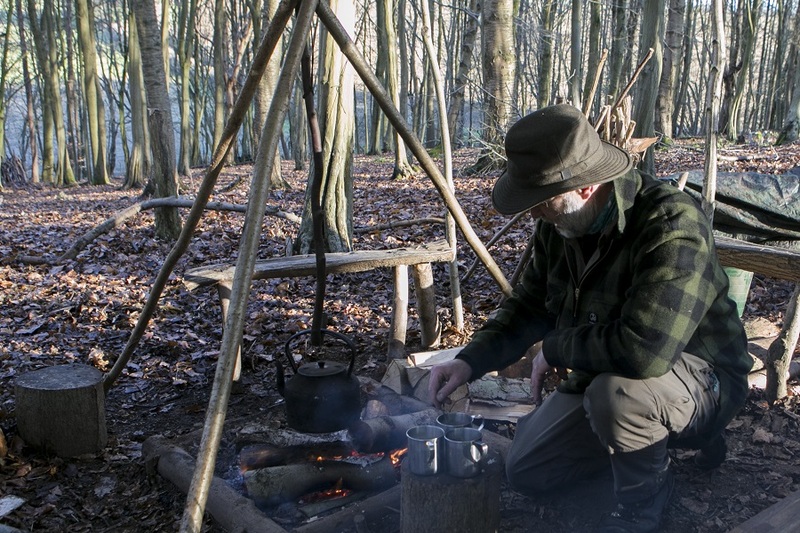 And there is always much to talk about, from the simplicity of the tripod where the kettle hangs over the fire, to the fascination with camping out in the wilds of the wood. From here we set the scene, talk about what we will do; learning fire lighting skills, carving utensils, baking bread and taking in the wonders of the wood. Today a little filming and conversations about me! We talk about the Chilterns, those rolling hills, how the fallow deer visit near by most mornings, the badger sets nestled around the woodland margins, the variety of trees, the opportunities for a little foraging and how this is such a beautiful area to explore and enjoy. 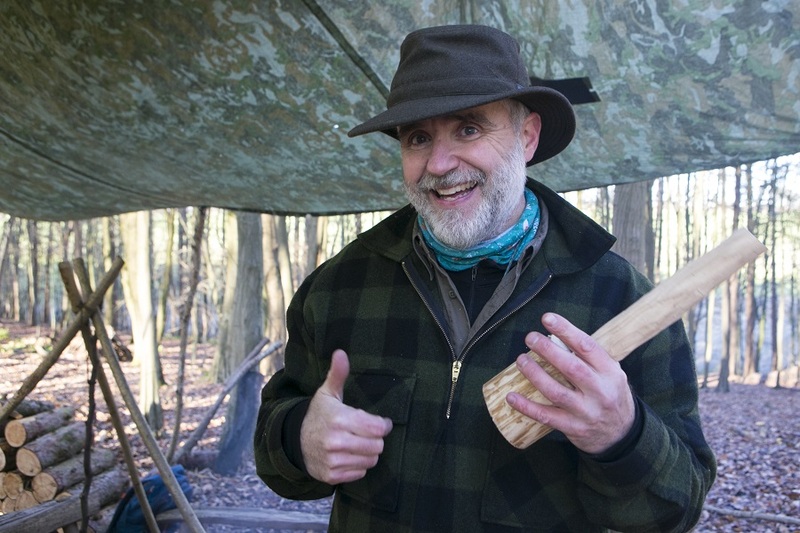 I spent a year studying aspects of Bushcraft, from survival orientated topics through to woodland management, and most valuable of all was in how to teach, without which it would be difficult to share these skills with those young and old who join me inn the woods. 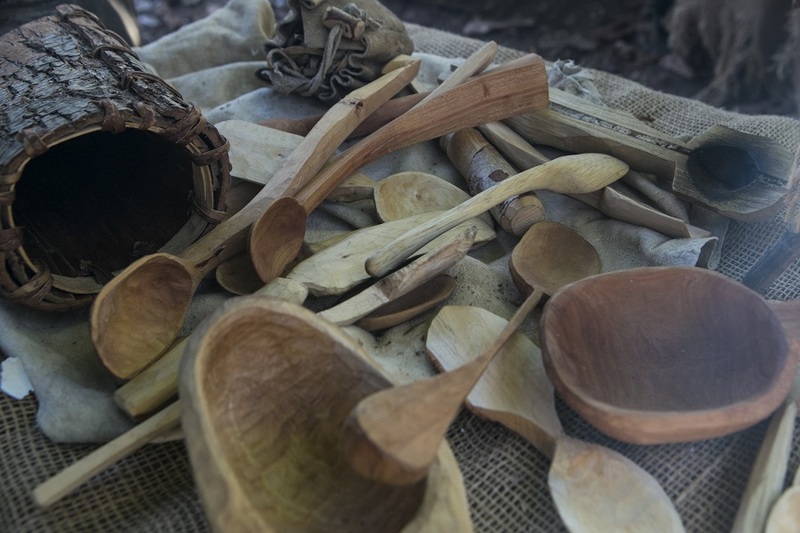 One of the subjects I love to teach is woodcraft; carving utensils and other useful objects from pieces of wood. 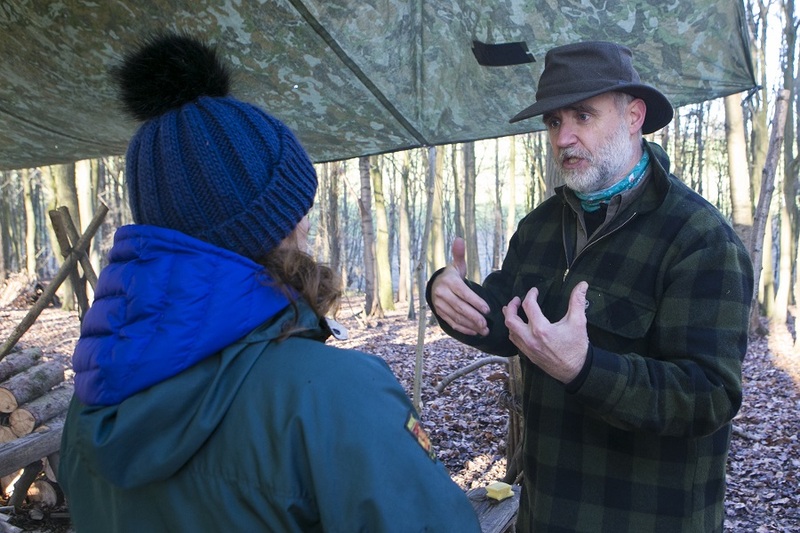 Often we will take a walk through the woods first, learning about the trees and harvesting materials, perhaps a branch of hazel or birch, for our projects. 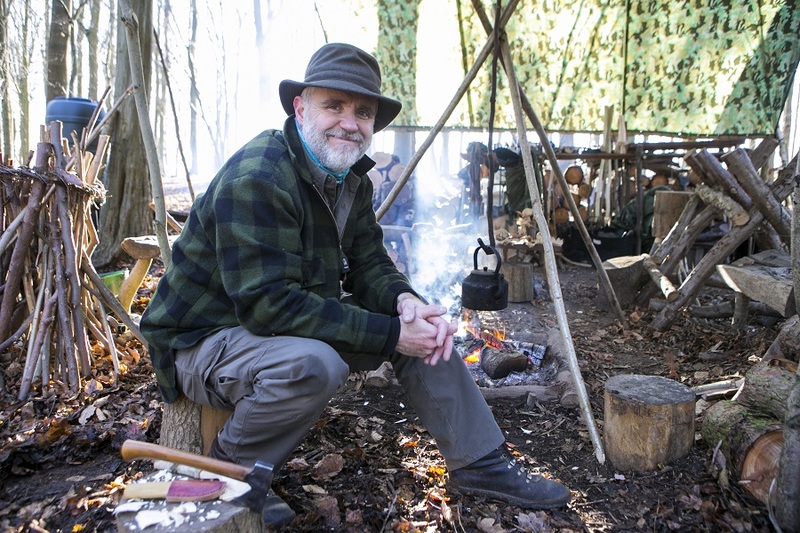 There really is something quite special about whittling a piece of wood and creating a simple tool, a hook to lift the lid of a pot or to suspend a kettle over a campfire. Making a wooden knife to spread butter on freshly baked bread or the satisfaction of carving a spoon with which to eat your meal. 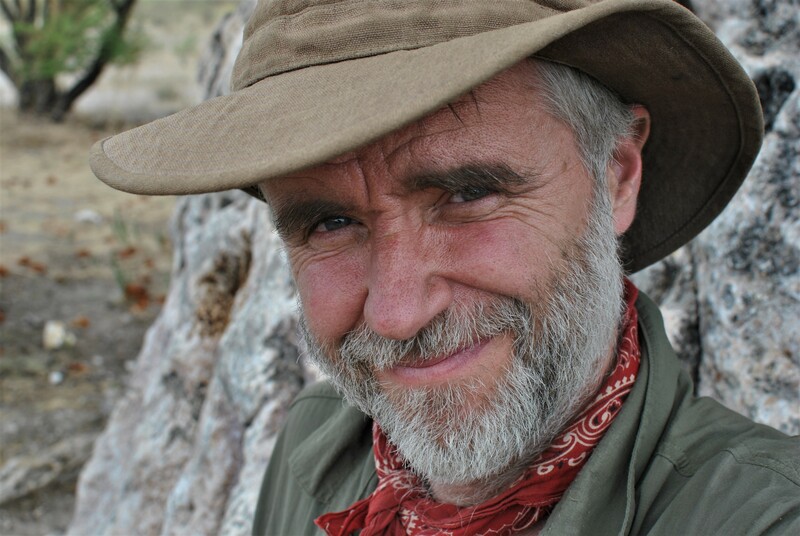 Here you experience the use of a few simple tools; mostly a small saw and knife, the reawakening of dormant skills, and then the realisation of what it is to whittle something special, an object that is personal and often treasured. Sometimes it is the simple things that capture the imagination, the playfulness of making something that we may have made as a child, or indeed, wish to show todays children. 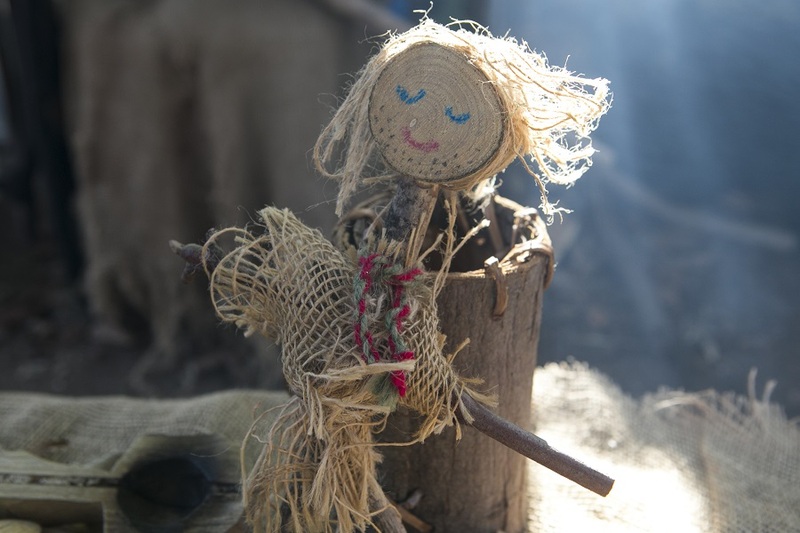 Such a simple project, provides the opportunity to gather sticks, use tools to cut them and drill a hole with a traditional hand-drill to fix the head on to the body, fashion a cord to tie around it’s waste – the result a stickman or woman. 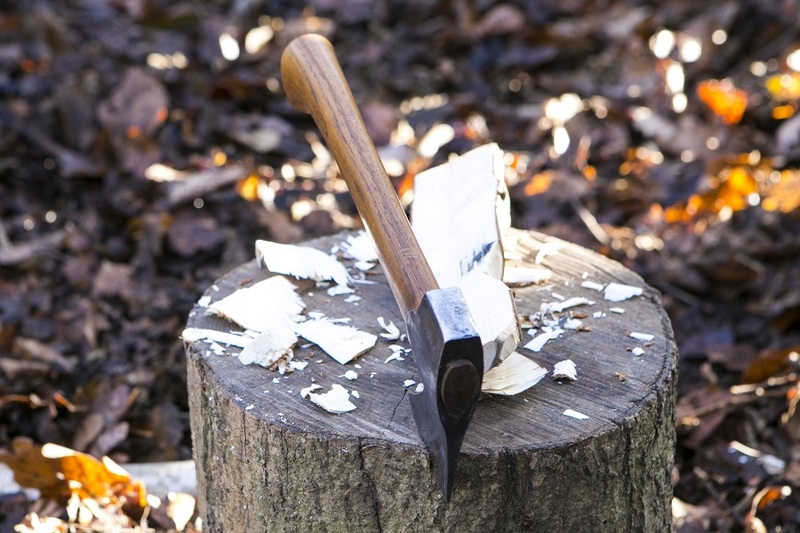 And in trained hands, it’s wonderful to chop wood, whether that’s fashioning a tool or utensil, or bringing out the larger axes or big splitting maul to prepare our firewood. It’s good to have a selection of firewood, softer wood that burns quickly, perhaps to increase the warmth of the fire or a hardwood such as oak or ash to burn more slowly and consistently for cooking or baking. The woodlands comprise a variety of soft and hardwoods, broad leaved and coniferous. One of the wood stacks is that of larch, there are some lovely specimens in the woods, with many more than 20 metres tall. Larch burns quite quickly if split, but left in the round, will take longer to burn and provides bright red embers that radiate heat for cooking and warmth too! 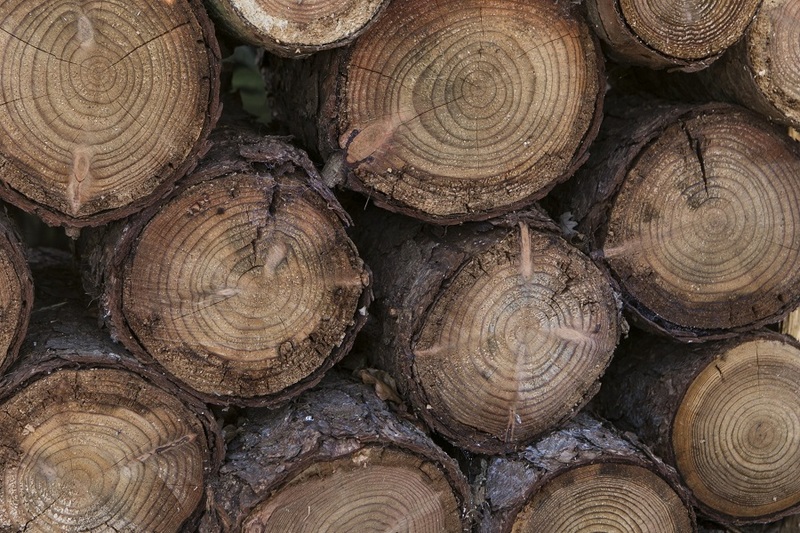 It’s easy to overlook the growth rings and radial lines of a log, but taking a closer look, provides some insight into the life of the tree. Yes, those growth rings will help us age a tree, the rings here are wide indicating more rapid growth as compared with hardwoods such as oak or hornbeam. 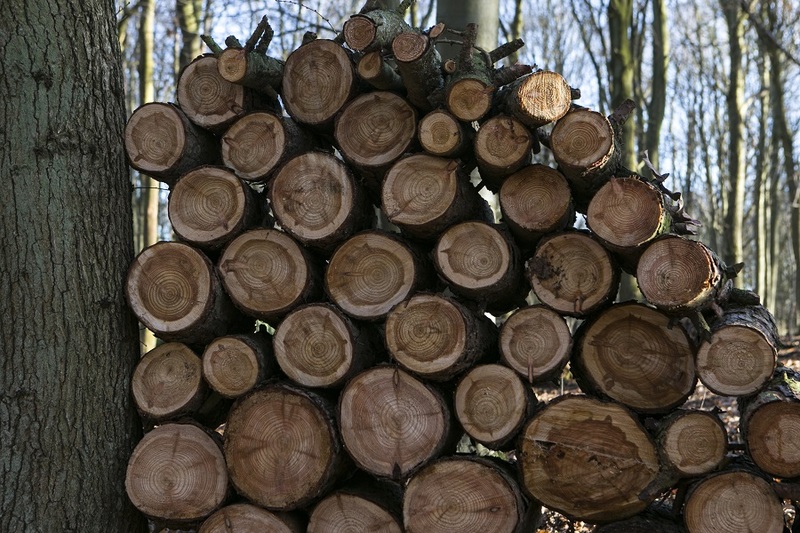 Radial lines may compartmentalise infections, or simply be easing of pressure as the logs dry out after being felled. The fascination for me here is the shapes made from the branches – can you see them? Taking a closer look to marvel at the decaying leaves – which ones can you identify? When we go for a walk, do we look down at the leaves, we hear them rustle in the wind and enjoy kicking a few, especially when they are crisp on an autumn day. Take a close look and they will reveal the storey of the woods, which trees are above us and those that are near by. 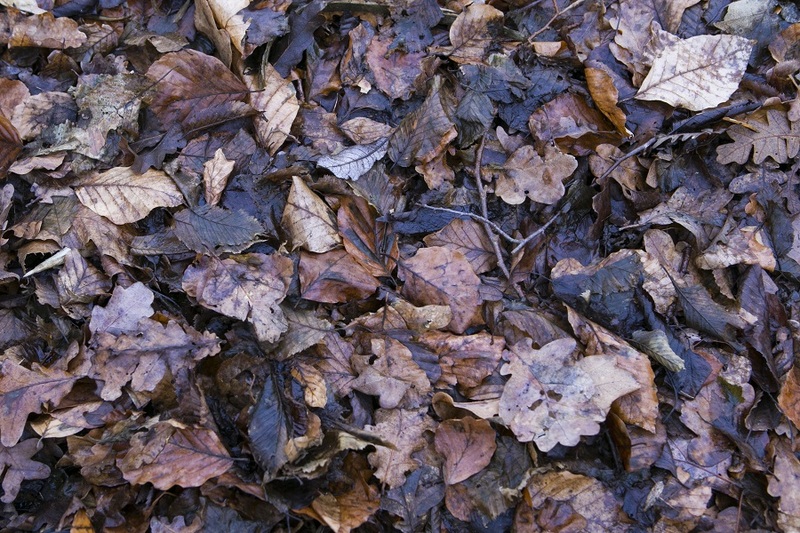 Can you identify the oak leaves, tell the difference between those of the beech and hornbeam? It’s wonderful to gather up a handful and see what we have. It was a pleasure to welcome Nicola Schafer and Annette Venters from Visit Chilterns to the woods, share a little of why I love being here in the Chilterns, talk endlessly about nature and the simple enjoyment we can all experience in this lovely part of our countryside. We all need time to relax, breath fresh air and be grounded in nature, providing a sense of wellbeing that enables us to function better in our daily lives. And a big thank you to Nicola for sharing all these wonderful pictures – if you need some great pictures, then do get in contact with her! I hope you enjoyed some of these lovely pictures and a little of what I get up to in the woods – this is my favourite place to be, and that includes sharing it with everyone who would like to visit this corner of the Chilterns. To find our more and experience this for yourself, family, and friends or colleagues, give me a call, check out what courses are scheduled and / or sign up for course announcements. – thank you!